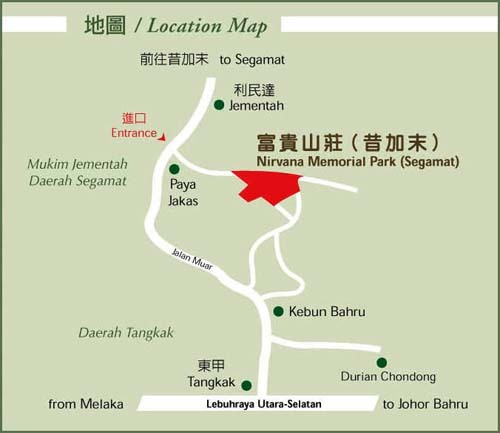 Nirvana Memorial Park, Segamat was launched in 2003. Located at Jementah near Segamat on a piece of choice land 102 acres in area. 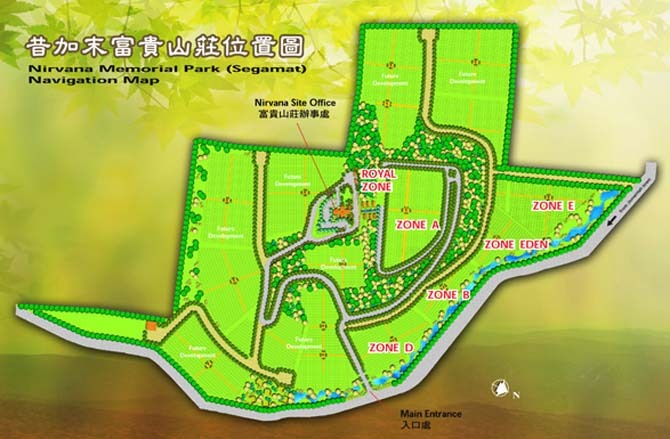 It is a strategic location, only a 25 minutes' drive from Segamat. 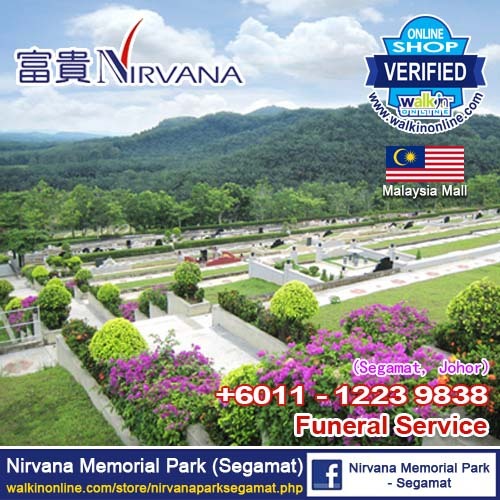 It is on elevated ground and is endowed with good Geomancy, commanding a breathtaking view.Nirvana Memorial Park, Segamat is designed to the same standard of landscaping and architecture that has won numerous awards for Nirvana Memorial Park, Semenyih. The Entrance Arch is especially designed with the needs of the locals in mind. Inside the Park, there are temple, urn pavilions and beautiful landscaping which includes fountains, bridges and arbors. Lush greenery and permeates the whole Park which is serviced by spacious roads and ample parking lots. The Guan Yin Columbarium is inspired from the ancient Chinese style. The building contains 3 individual houses fashioned after ancient architecture surrounded by a lush garden at the center. The peace and tranquility environment would surely make visitors feel relaxed and comfortable. Bamboo also represents a time-honoured tradition, bringing generations together to foster a greater bond in life. With the compassionate and merciful Goddess of Mercy over looking the courtyard, one cannot help but feel the love that enlightens and bond family together. Amitabha Buddha has the supernatural power of assuming any form required in order to relieve sufferings and provide enlightenment. Regarded as the personification of compassion and kindness, Amitabha Buddha is able to help sentient beings eradicate ordeals and obstacles, and to get us out of the sea of sufferings. 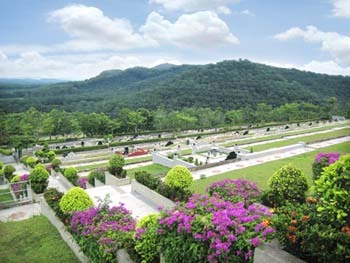 Royal Zone is situated at the highest point of the park and is undoubtedly the most distinguished pieces of the burial ground. Royal Zone presents a panoramic view of rolling hills to the delight of the eyes. Set against a charismatic, majestic mountain, Royal Zone would surely bestow upon its residents with boundless fortune and outstanding greatness, rendering itself as one of the choicest plot of burial lands. Royal Zone is designed to mark the journey home for the departed. It infuses the future generations with pleasant recollections of the departed. This family memorial court embodies a free mind of individuality and personality as integrated into the design of the plot. Royal Zone lets you take pride in immortalizing your family's history, commemorative remarks and any other historical accounts about the departed. Cherish the beauty of reminiscence in an idyllic setting brimmed with a panoramic vista as you remember your loved ones. 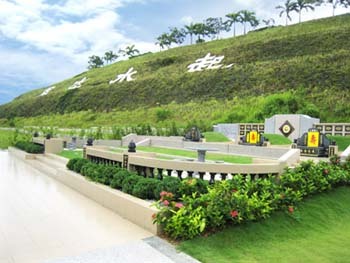 Blending with Chinese cultural arts and the concept of peace and tranquility, Guan Yin Dian columbarium is indisputably a magnificent resting place for those who opt for cremation.